Tilly XV, the most hale and hearty of the Centenarians. The sharing of passion is the perfect way to sum up the Nioulargue Spirit which is particularly prevalent on Thursdays at Les Voiles de Saint-Tropez. From boat to boat, skipper to skipper, owner to owner, it’s about challenging one another for the sheer beauty of the gesture, for the pleasure of racing with intentions other than finishing ahead of a fellow competitor. Club 55, Challenges: at sea and against one and all The Club 55 Cup breathes life and soul into this fine image every year and in the 2018 edition it’s the sloop Savannah which put up a mighty defence against Eugenia VII and managed to get her name etched on the very exclusive cup a second time. Indeed, these two fine craft got the ball rolling for other challenges off Portalet, but the freshening breeze led to an increasingly rough gulf and ultimately any future challenges were forced to lay down their arms. 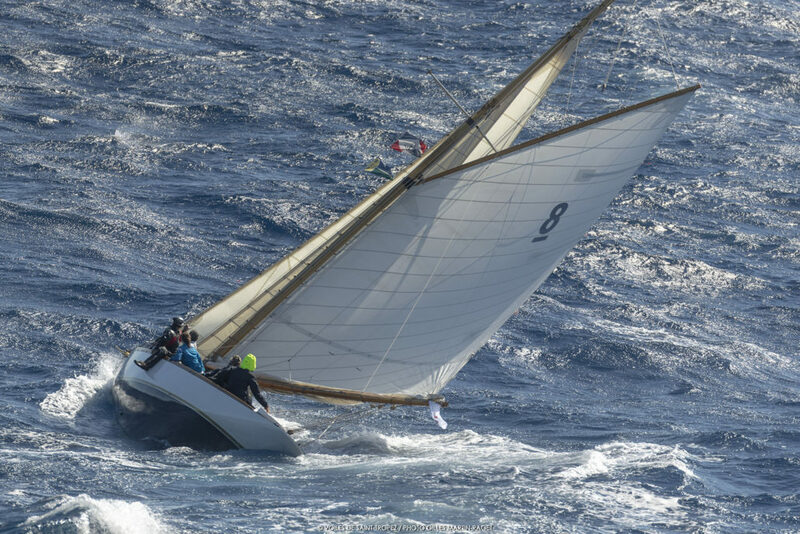 Today’s partner: Pommery For the eighth consecutive year, the Champagnes Pommery are supporting Les Voiles de Saint-Tropez. The manufacturer from Reims is in the perfect spot to welcome visitors at the entrance to the village and throughout the week it welcomes French and International clients. The convivial venue with its typically bold branding and its resolutely modern blue décor, also benefits the partners of Les Voiles who hold receptions here. For the event itself, Pommery has created for the skippers a limited series of 400 “pops”, 20cl mini bottles in the brand’s colours with the Les Voiles de Saint-Tropez motif. The Champagnes Pommery were created in 1856. Their cellars were dug straight out of the estate, in the chalky subsoil of the Champagne domain, where they stretch some 18km and keep over 20-million bottles at a constant temperature. PROGRAMME MODERN YACHTS Saturday 29th, Sunday 30th September: Registration and Inspection Monday 1st, Tuesday 2nd, Wednesday 3rd, Thursday 4th (J.Laurain Memorial Day, Challenge Day), Friday 5th, Saturday 6th October: inshore races, 1st start 11h00 CLASSIC YACHTS Sunday 30th September and Monday 1st October: Registration and Inspection Sunday 30th September: arrival of the Yacht Club de France’s Coupe d’Automne feeder race from Cannes Tuesday 2nd, Wednesday 3rd, Thursday 4th (J.Laurain Memorial Day, Challenge Day, Club 55 Cup, GYC Centenary Trophy), Friday 5th, Saturday 6th: inshore races, 1st start 12h00 Prize-giving for everyone Sunday, 7th October, from 11h00. http://www.lesvoilesdesaint-tropez.fr/les_voiles_de_saint_tropez/wp-content/uploads/18VSTD5_8341.jpg 1417 2126 SNST99@beauVAR-83 http://www.lesvoilesdesaint-tropez.fr/les_voiles_de_saint_tropez/wp-content/uploads/vdst2017siteOK.png SNST99@beauVAR-832018-10-05 12:07:262018-10-05 12:07:26The Nioulargue Spirit! L’esprit Nioulargue ! J’peux pas, j’ai les Voiles !